Using inspiration from a recent tour plus some reliable favorites of our clients over the years, we are happy to present this amazing opportunity to experience some of Europe’s many delights in an intimate group of no more than six persons. Guide James Derheim, who would have arrived in Berlin the day before, meets you at the new international airport. 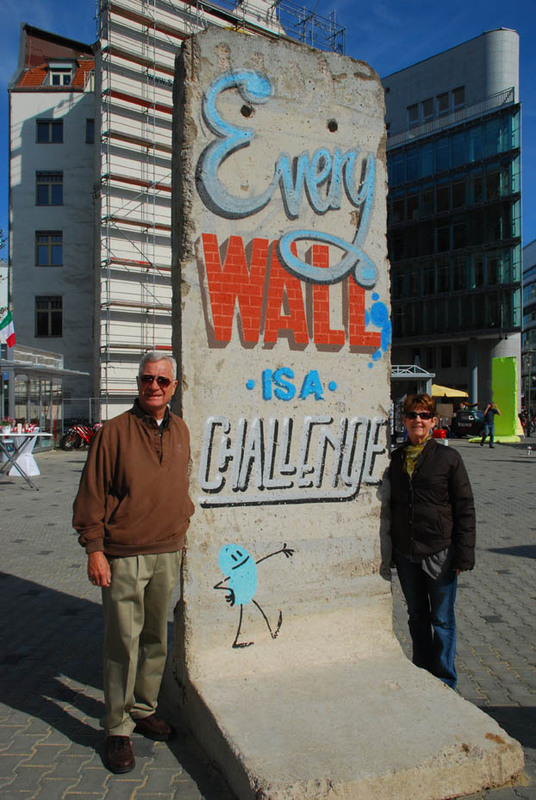 You travel with James’ guidance in the Derheim’s company van (a VW seating up to six passengers plus driver) to the heart of Berlin for a stay of three nights in your own private apartment in the historic Kreuzberg section of Berlin. 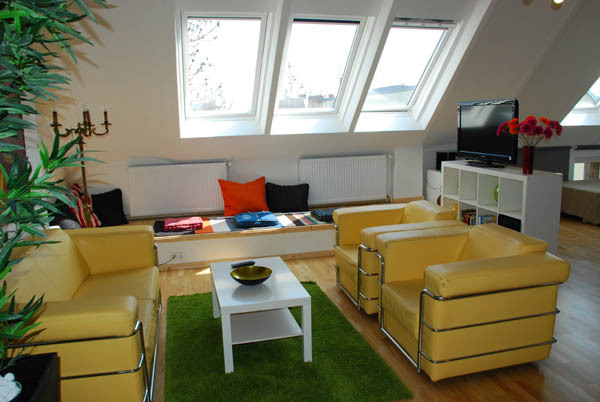 This apartment complex features self-catering apartments accommodating up to four in a large, comfortable atmosphere. A café across the street provides an excellent breakfast. You are living as the Berliners live! We are just half a minute away by foot from the bus, which takes us to the many historical highlights of Berlin. We get around the metropolitan area using Berlin’s highly efficient, comfortable and safe metro and bus system. It’s a fun way to get around and it solves the main problem of sightseeing in any large city – lack of parking. 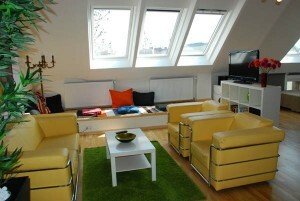 Stay in a spacious apartment in Berlin! 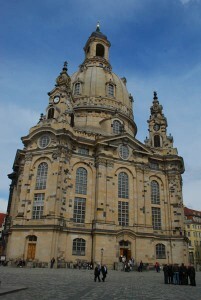 We drive to the city of Dresden, located a little less than two hours south of Berlin. We take the back roads so that you can enjoy the countryside with our lunch stop the medieval town of Torgau. This was the meeting place for the U.S. Army and the Russian Army on April 25, 1945 in the last week of World War II. •	The royal jewelry, on display in a museum. One has to see the workmanship in gold and silver to believe it. We travel south through the Erzgebirge mountains with a stop in Seiffen where nutcrackers and other holiday ornaments are made. Guests have the opportunity to purchase these handmade items at great prices, direct from the maker. Enjoy a tour of Prague in a 1930s jalopy! 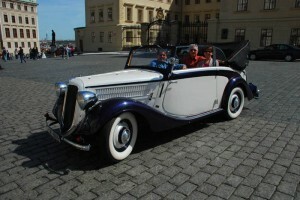 •	A ride around the city by jalopy, fun! A small city founded by the Romans as a military camp in the 2nd century. We stay in the heart of the town next to the towering cathedral and spend the rest of the day enjoying the narrow lanes, towers and most importantly, some of the best bratwurst and sauerkraut in Germany! We drive west with a stop in the historic city of Nurnberg for a look at the sights including the former parade grounds of the Nazis, used for huge rallies in the 1930s plus the historic city center, castle district, river district and more. 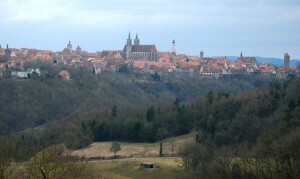 We then use the back roads to Rothenburg ob der Tauber, one of the best-preserved medieval towns in all of Europe. Guests stay two nights in an inn located in the heart of the town within easy stroll of all of the major sights. •	The Kathe Wohlfahrt Christmas Store – Christmas all year long! •	Eating in a typical country inn, best schnitzel around! 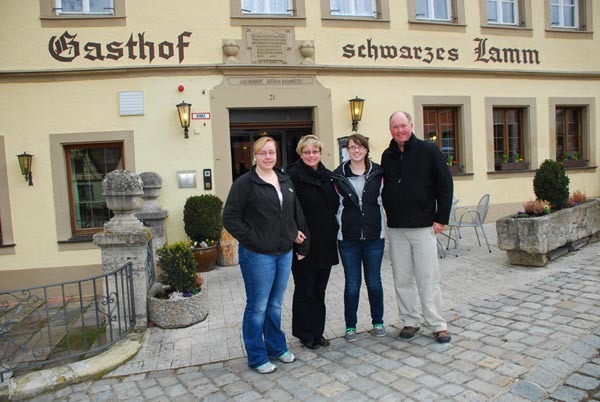 We travel to a charming small town on the Rhein River not far from the Frankfurt Airport. We stop for lunch in Miltenberg am Main along the way. •	Breakfast and lunch. Lunch will be soup or salad or a sandwich or something else light to your taste. Dinners, usually in locations offering authentic food which have been pre-vetted by your guide. Dinners are not included in the cost of your tour. •	Comfortable rooms or in the case of Berlin, an apartment, in unique, exceptionally comfortable and carefully selected hotels. •	Transportation by our company’s full-sized van. •	Incidentals, tolls, fuel, sightseeing, entry fees, tips or payments to local guides, etc. Not included: Dinners and airfare. Airfare quotes are provided on request. Trip cancellation and interruption insurance is mandatory and should be purchased within 15 days of signing your contract and booking your travel dates. You can book through European Focus, Inc or through your own travel agent. Trip insurance usually costs about 5% of the total cost of the trip and is determined by the age of the clients. 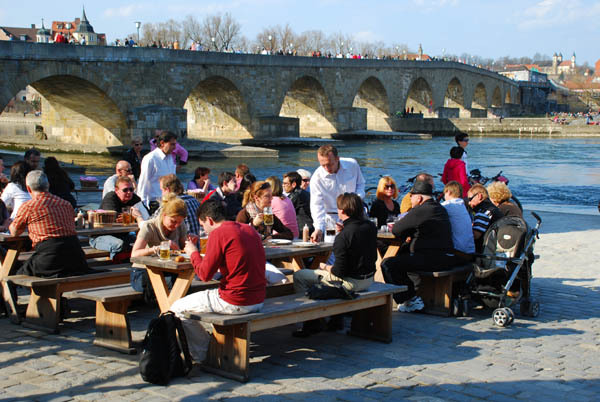 Posted in Europe Tours, Germany Tours and tagged berlin, dresden, europe, family, germany, group, in, miltenburg, of, prague, private, regensburg, rhein, rothenburg, small, to, tour, touring, tours.